Our onsite Explorer Classes are offered in Aquarium classrooms and make a great accompaniment to any field trip to the Aquarium. Students learn about marine life and habitats, practice science skills, and are encouraged to develop a stronger science identity. 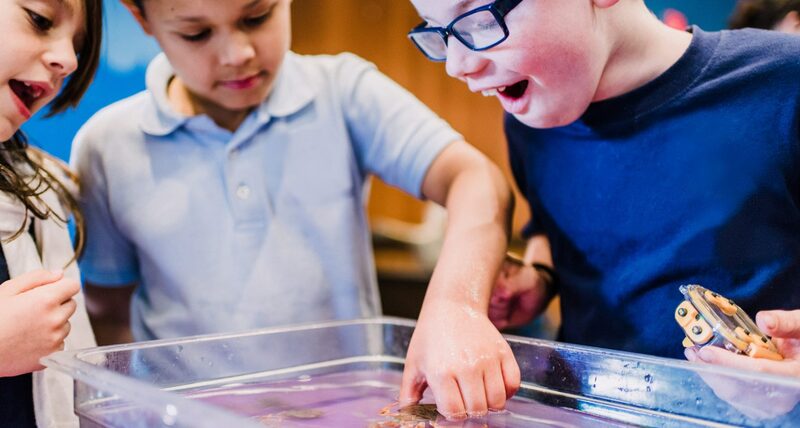 Each program is designed to reinforce grade-specific science topics and provide a hands-on component to your Aquarium field trip experience. Below, you’ll find programs for all ages grouped by subject—tidepools, penguins, sharks, squid, and others! Each is a strong fit for the Massachusetts curriculum standards. All Explorer field trip classes take place at the Aquarium, last 45 minutes (unless otherwise noted), and are $7 per student in addition to Aquarium admission, $70 minimum. Book a tidepool program to engage students of all grade levels in ocean science. These hands-on programs can provide sensory exploration for toddlers, deepen the context for elementary students learning about habitats and adaptations, or challenge high school students to explore topics such as ecology and intertidal zonation. All tidepool programs include live tidepool animals. This program for ages 12 months to 3 years allows toddlers to explore the textures, shapes, and movements of different live tidepool animals. Using guided imagery, a child-size costume, and live animals, students will explore and interact with local tidepool animals while learning basic biology and anatomy. Students learn about and investigate touch tanks that represent New England’s three coastal habitats. Students are encouraged to compare and contrast the habitats as well as observe the types of animals that are found in each one. Students discover how coastal animals have adapted to life in their environments by examining three different shoreline habitats and interacting with the animals that live there. Students explore cornerstones of ecological theory through interactions with intertidal live organisms and math. Focusing on student involvement, this program helps students gain understanding on topics such as niche theory, intertidal zonation, and animal identification. Turn your students into penguins! 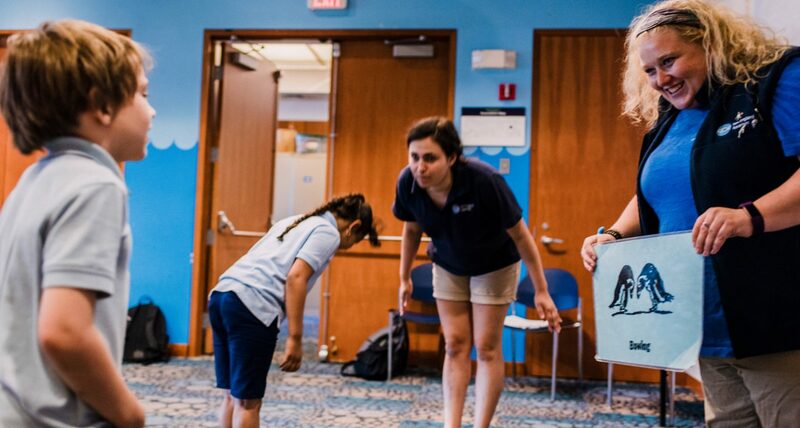 Aquarium educators will teach children how to act like penguins and how to collect and analyze data like scientists. 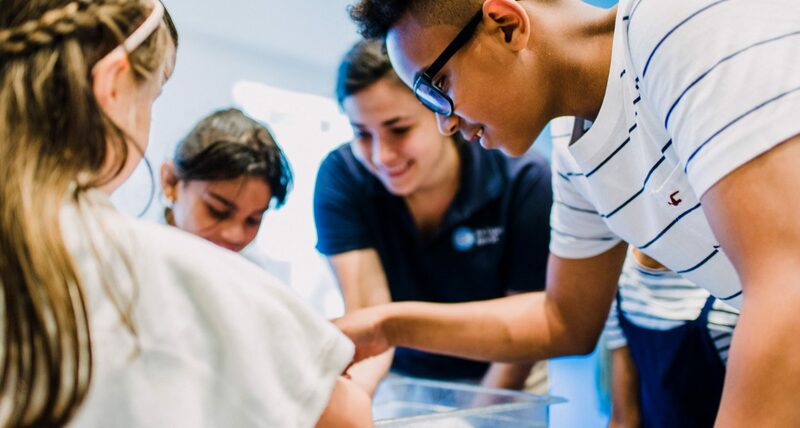 In addition to learning about penguin behavior, students will discover the variety of penguin species found at the New England Aquarium and throughout the Southern Hemisphere. This program was developed to fulfill National Council of Teachers of Mathematics standards. Our new Coastal Engineering Outreach Program challenges students to address the issues of local coastal erosion through the engineering design process, with an emphasis on communication and collaboration. 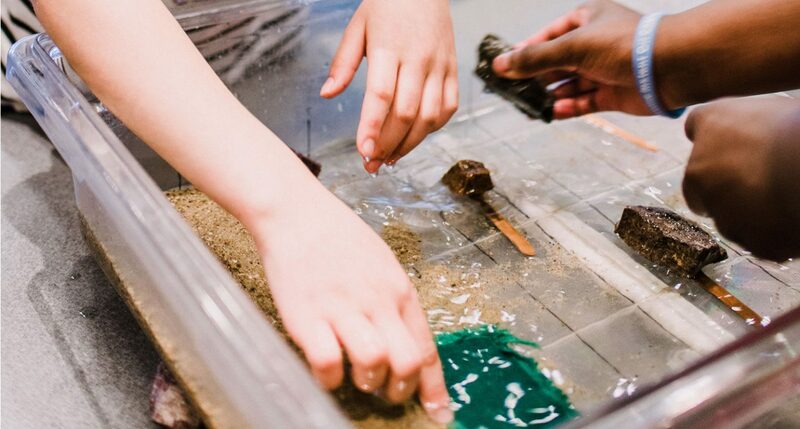 Students work as teams employing engineering design to plan, test, and present their solutions to limit the erosion of sand from their own section of simulated sandy coastline. Use the ocean in our backyard as your lab. Take a closer look at what lives in Boston Harbor, both large and small, and learn about how we are connected. Students will practice close observation and get a taste of what it means to be a marine biologist. This program is offered September to November and April to June. Program takes place at the Aquarium rain or shine. 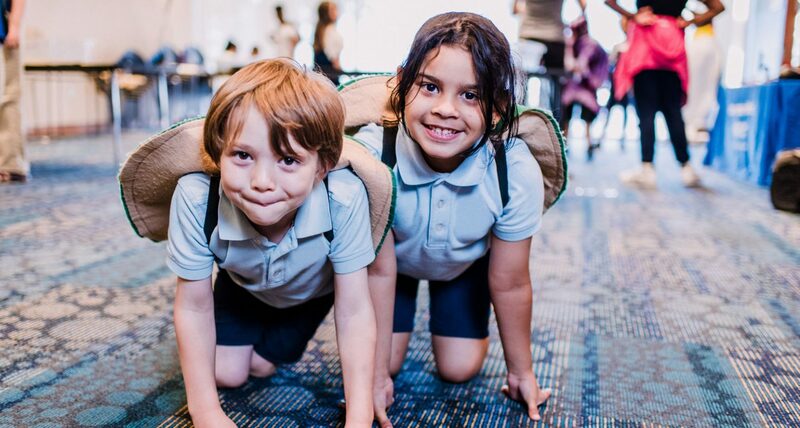 Students transform into turtle hatchlings and follow educators through a turtle’s journey from birth to adulthood. 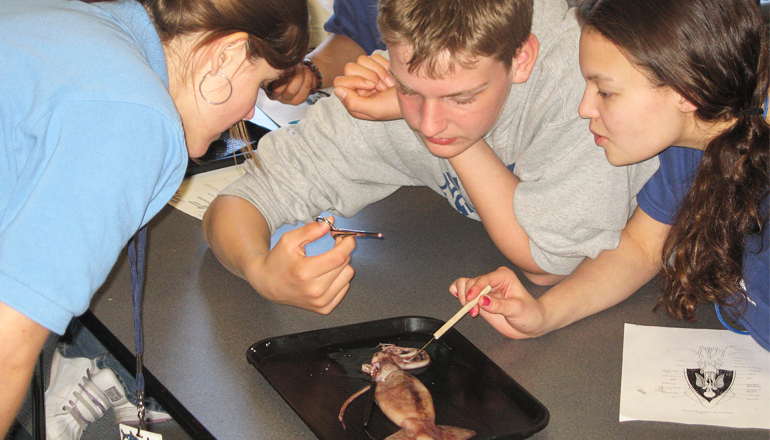 Through hands-on exploration of a real squid, students receive an introduction to dissection skills while learning to appreciate one of the most fascinating animals in the ocean. These classes are also available on the road. Let the Aquarium come to you! Learn about our Traveling Education Programs. Please make your reservation at least two weeks in advance to qualify for the group rate. Book your field trip or program with Central Reservations at 617-973-5206, email groupsales@neaq.org, or complete a group inquiry form.